Just like every year, the 17th edition of the TPi awards brought together the best and brightest in UK touring on the night of the 26th of February. For ArKaos, it was the perfect time to dust off our black tie and polish our high heels. Together with Agnes Wojewoda, Benjamin Bauwens and several of our most important partners, we sent along our reporter Marilor to capture some of the atmosphere of the night. We were proud to be one of the sponsors, part of the audience and, most importantly, part of the show technology! Marilor’s first interview of the night was already a big one… Operations Manager Benjamin Bauwens and ArKaos Managing Director Agnes Wojewoda give us their take on the technical setup, the awards and why ArKaos chooses to be a TPi sponsor. Meet ArKaos Team at Prolight+Sound! Read more about Meet ArKaos Team at Prolight+Sound! In April, ArKaos will be at Prolight+Sound to showcase the latest in videomapping hardware and software. During the four exhibition days, our booth will be equipped with lighting fixtures, LED strips, Kling-Force LED, media servers and a lot of experts to talk to you. We also have a big announcement to make, so make sure you're there! Ableton is known for creating fast, fun, intuitive ways to make music with products such as Serato, Live, Push and Link. Ableton Link is a technology that keeps Link enabled applications in time over a local network. Link synchronizes musical beat, tempo and phase across multiple applications running on one or more devices. ArKaos At Prolight & Sound In Dubai! Read more about ArKaos At Prolight & Sound In Dubai! Let’s meet ArKaos in Dubai! 17 - 19 October in ArKaos / ROBE Hall 4 C12! Discover the perfect combo of the Robe Spiider and ArKaos technology! 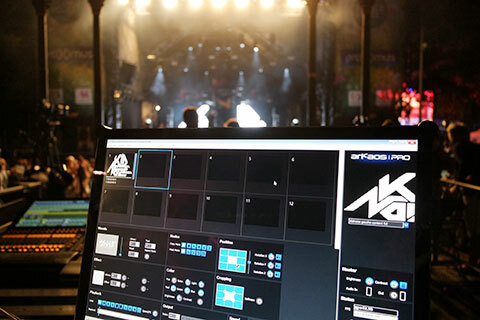 ArKaos will showcase MediaMasters’ latest updates and highly anticipated features. As well our Kling-Net protocol that makes the programming of LED devices so much faster and easier. Combining the Robe Spiider with ArKaos technology opens up a brand-new world of lighting possibilities. Now’s your chance to ask questions, see the latest products in action! We know it's the expertise and energy of our team that propels our growth. Right now we're looking for a talented UK Sales Manager to join our team. Are you a highly motivated, results-driven sales professional in the professional video and lighting sector? If so, we'd love to hear from you. In this dynamic role, you will be responsible for growing the business by developing relationships, effectively communicating our brand and increasing market share. Candidates must have an existing customer network and a solid understanding of the industry, along with an ability to identify prospective customers and meet our profit objectives. Candidates must be tenacious, persuasive and flexible with an eye for opportunity and possibilities in the UK market. You are welcome to visit our booth J60 and to discover our latest products and features. We'll be launching a new release of MediaMaster, and the much-awaited Kling-Force LED the new hardware platform built by ArKaos, around the combination of a powerful processor and a hardware network switch. It creates a robust and efficient Kling-Net network. It's your chance to see these great new products in action and get them demonstrated by our staff! The Kling-Force LED app for Android and iOS is a creative virtual version of our Kling-Force LED interface. It’s available to you to play with for FREE. The Kling-Force LED allows you to drive up to 8 LED tapes. 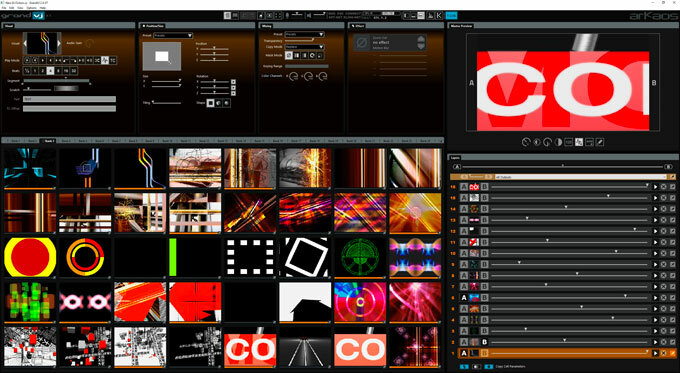 You can learn the way to integrate it into ArKaos products such as LEDMaster, MediaMaster and GrandVJ XT. It will show you how to use LEDMaster to send colour patterns to the Kling-Force. 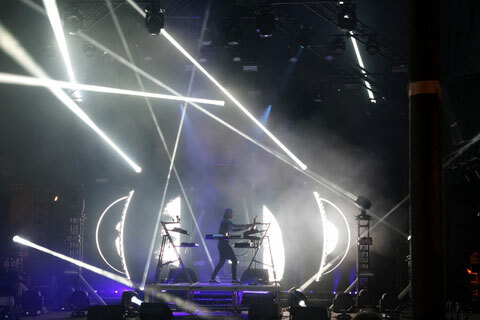 ​The Belgian man with a monkey face, Kid Noize, recently delivered ​this Thursday 20th July ​a great DJ set at the Francofolies de Spa. As usual, the visual aspect was an important part of the show. Lighting designer Rudy Fastre​ ​chose an ArKaos PRO Stage Server running Mediamaster 5.0 software. 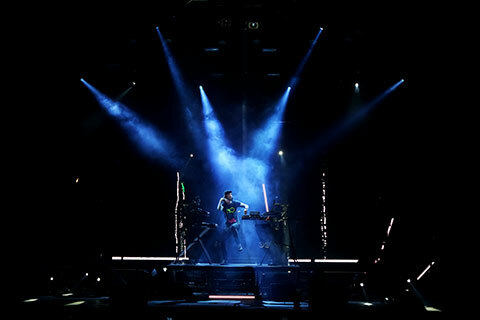 Controlled with a GrandMA2 console, Rudy uses it to mix some stunning visuals and live video streaming on stage. LED Lighting for everyone! Kling-Net is a revolutionary plug-and-play protocol for easy operation of LED devices. ArKaos provide the free application to experience the benefits of Kling-Net protocol.